Diverticulitis sufferers often struggle with figuring out what to eat and how to introduce more foods into their diets. A diagnosis can be difficult and diet recommendations vary for an acute episode of pain versus during remission of the symptoms. Studies at the Mayo Clinic show that diet alone can't cure diverticulitis but may help to relieve some of the symptoms. Avoiding foods that cause the symptoms to worsen may offer relief and shorten the episodes of discomfort. 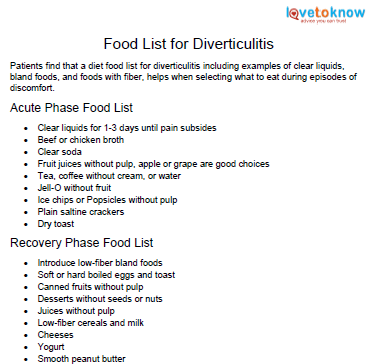 Patients find that a diet sheet for diverticulitis including examples of clear liquids, bland foods, and foods with fiber, helps when selecting what to eat during episodes of discomfort. A diet sheet can be a quick reference for those circumstances where you don't know the best food choice. Click on the sheet below to download and print it using Adobe. These diet suggestions offer your digestive system a chance to rest and recover from the inflammation of diverticulitis. You may need to follow these suggestions for a week or two or until you are pain free. If vomiting persists you need to seek medical attention to avoid serious complications like dehydration and obstruction. Your initial diet during the acute phase should consist only of clear liquids for 1-3 days until the pain subsides. After that you can slowly work the following foods back into your diet. A sample menu for breakfast could include a cup of clear Jell-O, a dry piece of toast, and a cup of apple juice. Lunch might include a cup of broth and a few crackers. Dinner choices could include a cup of broth, a bowl of Jell-O, and a glass of clear soda, tea, or water. Including snacks in between meals will decrease hunger. Snacking on clear soda, Popsicles, broth, or ice chips will help to avoid dehydration during an acute episode of inflammation. As symptoms subside a bland diet is recommended. 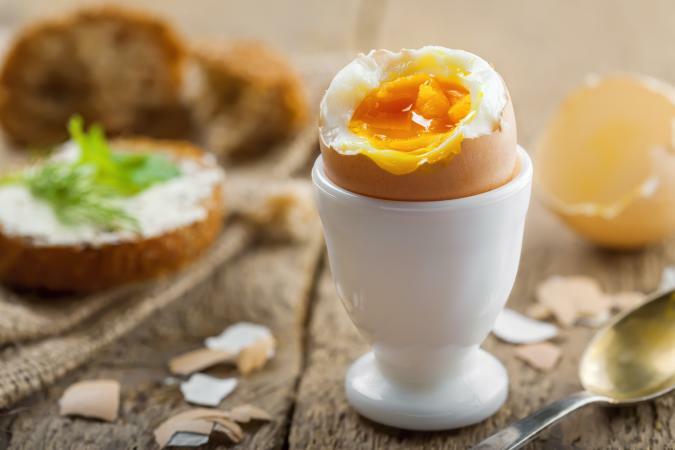 Breakfast could include a boiled egg, cheese, and dry toast. You may enjoy a yogurt smoothie, toast and peanut butter, peeled apple slices or canned peaches for lunch with tea or clear soda. Dinner could include macaroni and cheese, a tender chicken breast, and well cooked green beans with a beverage. Snacks in between meals could be yogurt, cheese cubes, Popsicles, or fruit. The symptoms of pain, diarrhea, and vomiting should be absent when moving on to your regular diet routine. At this point it is important to listen to your body. Now you want to increase the fiber in your diet to keep your digestive system moving. This avoids constipation which leads to the initial inflammation. Introduce nuts, seeds, and raw vegetables back into your diet slowly. Do this by having nuts one day and maybe your favorite raw vegetables in the next day or two. This way you can see if pain begins again after certain foods. Know your body and how you react. Pay close attention to your symptoms and avoid the foods that cause the pain. If your symptoms do not resolve in three or four days it is always wise to consult your physician. Also seek medical attention if you have a fever, the pain gets worse, and you have consistent vomiting or lack of bowel movements. Complications from obstruction, dehydration, and pain may need hospitalization for further diagnosis and treatment.